Have you decided your art will never earn you a living? Jeff Goins, author of Real Artists Don’t Starve and The Art of Work, has figured out the difference between hobbyists and artists—the graphic designers, writers, musicians, and painters who actually make a great living from their work. What is it about their creative process that’s so different? We discuss the mindset of a starving artist, the myth of the “big break,” and discover how you can find your purpose by going back and listening to your life. I kept running into two groups of people. People who I would call starving artists, where they would say, “Well, here’s my art, I would love to do this but I know that I can’t make any money off of it. It’s just going to be a hobby.” That was a familiar voice to me, something that I said for many years, when I graduated college. I played with a band. We toured North America for about a year, and we spent a month in Taiwan—we were huge in Taiwan, by the way. We actually played in and around the Taipei area. Shopping malls, like all girls’ prep schools with thousands of young women. Literally, we played the show and they had a balcony where all these young Taiwanese girls in skirts and plaid uniforms were a part of this prep school. In America, we were nobody obviously, because anybody listening to this has never heard of us—CTI1421. But we were playing this song, and I remember pointing up to this young lady, a 15 year old girl in the balcony. My ego is enjoying this too much. She just fainted. And after the show, they rush us off the stage and we had to run out and climb out the back window and go out the alleyway. For 30 minutes, I felt like Elvis Presley. It was like the Beatles playing Ed Sullivan. Anyway, during that year, I made about $8,000 that year. Seriously, $8,000 a year. Charlie Hoehn: Do you know how few people in the history of civilization can say they made a girl faint by winking at her? Jeff Goins: I think if it’s 2006 and you’ve got a guitar, just about anybody could have done that if they were willing to go to Taiwan. I mean, it’s very interesting, they were very much at the time like stuck in the ‘80s. All the teenage boys that I would talk to were like into Metallica and Megadeath. I just think it was like a very proper, conservative culture, and as soon as you gave them expression to let it all out, they went nuts. It’s a very small claim to fame and a fun one. During that year, we were playing, did not make much money, we stayed in people’s homes mostly to keep expenses way, way down and we’d get some money for gas, they’d feed us a casserole and they’d send us on our way. They weren’t saying this to be mean, they said this in their own nice ways. But almost every night, I was hearing this from somebody else. They were well meaning grownups telling a 23 year old kid how it is. And I was like “Yeah, you’re right.” I believed it. I did that for a year. I quit the band, I moved to Nashville—which is the opposite order in which you tend to do those things. I moved to Nashville to chase a girl…ended up marrying her, so I was good in that. Charlie Hoehn: This is ridiculous. You better start spitting out some failures pretty soon buddy. True, there’s plenty of failures. Living in Nashville, I just had this assumption that you can’t make any money off of your art, off of your creative work. So as a writer and a musician, these were always things that I dabbled in but never took very seriously. Eventually, I did and that’s a whole other story. But I wrote this book because now I understand that being a starving artist is a mindset. It’s not a necessary condition of doing creative work. They’re making a killing off of their writing, off of their music, off of their art, and they’re not superstars. I’m not talking about Katy Perry, you know? I talk to a lot of them and I interviewed them in the book. I found that a lot of them had many things in common. These things that they have in common—I call them rules—are the things that every starving artist actively avoids. I wrote the book because I realized there are two groups of people who are talking about the same thing: How to make money off of your art. And they’re talking about it in very different ways. I thought, well, one group needs to know what this other group believes and understands. Charlie Hoehn: What is it that successful artists are doing differently? Jeff Goins: I use artist in the same way that Seth Godin would use the term – any creative gift that you have to share with the world, I consider that your art. We all can be artists; it doesn’t mean we all necessarily are artists. That choice is up to you. If you’re not born with it, then you don’t have the talent, you don’t have the gift. When in reality, a thriving artist understands that their art is work, it’s a choice, and it’s something they have to keep choosing every single day. That’s one example; there are twelve of them in the book. Another one is this idea that you have to be original. I remember driving through Nashville with a couple of young women who were talking about some Kickstarter that turned into this 10 million dollar brand overnight, basically. It was just a great idea. They said, “Man, if we just had one great idea, that’s what it takes. With one great idea, we can make a million dollars.” And they were being 100% serious. Starving artists try to be original, whereas thriving artist understand that you have to steal from the greats who have come before you. You have to steal like an artist, as Austin Kleon would say. Starving artists are stubborn about everything, whereas thriving artist are stubborn about the right things. Without fail, most starving artists I meet are very stubborn about all the details. They’re caught up in the minutia. “Man, if this song, if this book, if this idea doesn’t make it, I don’t know what I’ll do.” They don’t really have a plan for—not if failure happens but when failure happens. Failure and successes will come, but they have this stubborn vision that they’re going to keep producing enough work that eventually people are going to notice them and they’re going to get the credit that they deserve. If you hear yourself say that, look out, you are in for trouble. Charlie Hoehn: How do you know that you are on the right path as an artist? I used to think there was like a set route to success, and I wrote a book called The Art Of Work which is about finding your vocation, your calling, your purpose, whatever you want to call it. I was a marketing director at a nonprofit, and I was helping other people’s ideas spread…There was something in me, I call it an itch. There was something in me that I just couldn’t quite scratch, and so I just started trying to find a way to alleviate this feeling of something’s missing. We were doing good work. I wasn’t in a job that I hated. Quite the opposite, I was good at my job, I had a good boss. I was very comfortable. I realized that was actually a dangerous place to be, because I could stay there. I wasn’t going to get fired, there weren’t going to be any major downsizing necessarily. I could probably coast there for the next five to ten years, getting gradual raises and increases in responsibility. There was just something in me that knew that would be settling. That would be not enough. Most of my friends who had chased their dreams had quit their jobs, gone and tried to start a nonprofit or the next charity water or they tried to start an online business or whatever. Six months later, they were broke and back at Starbucks. Dreamer to me meant flaky person. I was very reluctant to even put a name to it. That kind of took my breath away. I had been writing for most of my life. It had always been a part of me but never something that I was all in on, because I didn’t think you could make any money on it. The lesson that I learned was that activity follows identity. Before you can go do something, you have to become someone. What would I do? How would my behavior change? Well, if I’m a writer, I guess I should start writing. I literally started calling myself a writer, which I know is potentially a dangerous thing, but it was my way of forcing me to do the work. I thought, “Well, I better get to work, I don’t want to make myself a liar.” And so it wasn’t about faking it till I made it, but it was about believing it until I became it. Charlie Hoehn: How did that guy know that you were a writer? Jeff Goins: It was interesting. Basically, he knew that I had a blog and I think he just saw what I was doing and he could tell that underneath all the things that I was talking about, my actions spoke louder than my words. The fact that I was focusing a lot on my blog at the time and reading, you know, the War Of Art by Steven Presfield. You know, I was just like – it was something that I wanted to do and be but was too scared to voice myself. Sometimes, we are the last ones to recognize our greatest gifts. You know, Derek Server says, “What’s obvious to you is amazing to others.” I think it’s so obvious to us sometimes. We take it for granted. Jeff Goins: I was this fat kid growing up in the ‘90s wearing oversized, multiple flannels—because you know, everybody was trying to be Kurt Cobain—when I won the sixth-grade Spelling Bee. That year, I had a paper route, and I was so chubby and so prepubescent. I had long hair and I was often mistaken for a girl. I was collecting dues for the paper route, and I met this older gentleman, 65, 70 years old, and when you go and collect dues, they give you tips. That’s the whole reason you’re doing it, is for them to pay for their subscription, and hopefully you get a tip. First of all, he’s giving me money, so I feel a little bit guilty about correcting him. Second of all, you know, I’m just like, I don’t know what to do right now. They didn’t prepare me for this one. I took the money, and that was the worst thing I could have done. Every time after that where we would interact with each other, he would call me a “lady” or you know, “little miss” or something. I felt like I missed my chance to correct him. I didn’t play sports. If we were to get sort of therapeutic about it, it was probably something that at a very early age I clung to and made a part of my identity. Words, creativity, spelling, writing, communicating, it was a part of me for all of my life. In college, during finals times at 2:00 in the morning when I was stressed about a test the next day, I would go to the computer lab and write for an hour. I would write a short story or an essay and email it to myself to calm down and de-stress. I would write. And I remember thinking I would just do something else. The second thing, we were out of playing a dozen shows a week, at the top of my game playing guitar, the best I could have ever imagined playing, which was good. I mean, not Jimi Hendrix, but I was better than I ever thought I could be just by simply practicing so much. And my favorite part of the week was on Saturday afternoon when I would write a blog post recapping everything that we as a band had done that week. To quote Parker Palmer, when I started listening to my life, I felt like it was telling me that I needed to be a writer. Jeff Goins: One of the reasons why I wrote the book is because I think being a starving artist is a mindset. It is something that you can change. I actually believe that now is the best time to do creative work. Now is the best time to be a writer. Now is the best time to be a musician. So many people I hear are talking about like, “I wish it was back in the hay days of publishing when Stephen King was writing multiple books a year and getting paid a million dollars apiece for each book.” Obviously things have changed, but the bottom line is that it is now easier for more people to just get in the game than ever before. I would argue that it is easier for you to find the audience that your message, that your creative work is designed for. And if you can do that, you can make a living off of it. I just started interviewing working creative, and I heard tons of different stories. In the book, I compare those stories to historical examples. One thread throughout the book is Michelangelo, who is arguably one of the greatest artists of all time. An art historian named Rab Hatfield discovered several, many previously unknown, undiscovered bank accounts belonging to Michelangelo. Not only that, but when he came on the scene he became the richest artist who had ever lived up to that point. After him, people would obviously exceed his wealth, but he sat a precedent for artists. He wasn’t an outlier in the sense that he was an exception to the rule. He was the first, and he set a precedent in the Renaissance that many artists followed. He made it possible for artists to be wealthy—for them to be aristocrats themselves. Whereas before, they were in many ways blue collar, working class Joes. Here’s a guy who was on the top of his game creatively and was the richest guy and didn’t have to sell out to do that, didn’t have to starve to do that. What does that mean for us? They agreed on the very large sum of $20 because that was what they both concluded you would pay for a piece of random artwork at Target. And so she did the piece, gave it to her friend and her friend gave her $20. It was the first real money that she had made off of her art and she said, “That changed everything.” The fact that she went from zero to something just got the ball rolling. It got her to think about how she could start charging for her art, how she could start licensing her art, how she could start doing custom commissions and all these different things. Today, Melissa is a fulltime artist and teacher. I think there’s something powerful about that, and I like that story just because I talk to so many creatives who go, “I don’t need to charge for this. I don’t need to make a bunch of money off of this,” and that’s true. But there is something very validating about the moment when you get paid, when somebody asks you to come speak at a conference, when a publisher says, “We want you to write this book and we are going to pay you to do it.” Or when customers actually give you hard earned money for this work that you have spent so much time and effort on. It’s an incredibly validating experience, for sure. Jeff Goins: This is the most surprising thing that I found. By the way, each of these 12 rules in the book, these are things that all of the thriving artists had in common, and that starving artists actively avoided. So there are other things that thriving artists may do or they couldn’t find any correlation between that and artist who didn’t succeed. My definition of a thriving artist is that you are making a fulltime living off of your art. That could be $50,000 a year, it could be $500,000 a year, it could be $5 million a year, but you are making a sustainable income that allows you to do your work, pay your bills, eat more than Ramen—unless it’s a gourmet Ramen which is totally a thing now—and you’re happy. So it doesn’t count if you’re a political satire cartoonist for a newspaper when what you really want to be doing is the next Calvin and Hobbs. You really have to be doing your work and thriving at it in every respect. I find that challenging. But what I’ve discovered is that there is a difference between giving your best work away for absolutely nothing and doing what I call practicing in public, which is just like marketing. It’s showing your work, as Austin Kleon would say. It’s doing the work and then putting it in a channel where it has the greatest likelihood to succeed. And it’s also different from an apprenticeship. If you’re going to go volunteer or work for somebody for a little bit of money, you are going to gain an incredible wealth of experience for a season that can lead to a lot of other great paying gigs. That’s okay, that’s not working for free. That’s basically getting an education for free. I still do gigs for free. I’m sure you do too, but as I’ve gotten older and maybe a little bit more mature and been mistaken for females less often, I’ve just realized that when you work for that illustrious word “opportunity” and you haven’t been very clear on what that opportunity is, it ends up not leading to anything. I am sure there is that needle in the haystack moment, the story of the guy who says, “Yeah you can jump out the airplane and build your parachute on the way down.” But you are not hearing from the 99 other dead guys. The other thing is it doesn’t have to be a bunch of money. I used to do writing projects for free because I was trying to build my portfolio. Which a lot of people do, but I’ve been doing this for months and months and months, and it was not leading to anything. Then a friend emailed me, kind of like Melissa’s friend, and said, “Hey I want you to do this.” I was like, “Okay great. I’ll do it for free” and they’re like, “No I want to pay you for this.” What they asked me to do was write copy for signage in a National Park in Canada for $100. So there’s a couple of lessons here. One: you always need to be working for something. If that something is exposure, you need to get really, really specific. If I am going to write a blog post for your audience, can I link to my book? Or a free lead magnet that allows me get email address out of it? That’s very, very valuable, and he says, “I got hundreds of gigs from that one free gig.” That’s not working for free. That’s working for something. It’s just delaying gratifications, delaying the money to later. Charlie Hoehn: What would you challenge listeners to do right now? Jeff Goins: I think the first step, going back to the beginning of our conversation, is really thinking about your identity. I know it is a little woo-woo, but it’s important. I love the quote that “Most of us climb a ladder in life only to realize that it is leaning against the wrong wall.” Spend some time listening to your life. It doesn’t have to be this deep Zen spiritual practice. It can be, but it can just be practically looking at the timeline of your life, as I did. What was I doing when I was five? Oh I was drawing pictures of superheroes and trying to make my own homemade comic book. So what was I doing when I was 10? Reading the dictionary. What was I doing when I was 15? Writing songs. What was I doing when I was 20? Starting a blog. You start to see a bunch of different experiences, but then you also see a thread. How is your identity and the role that you are playing in life—how are those intersecting or not? I do think we are all artist in our own way, but also I think it’s a choice. The first chapter of the book is called “The Rule of Reinvention” and basically it’s about the choice that we get to make every single day. If you don’t like this story that you are living, then tell a different story. Change it. One of the guys that I talked to in the book was a major league baseball player. For his first year playing for the Chicago Cubs, where you get a million dollar signing bonus, a minimum of half a million dollars salary a year, playing for crowds of 40,000 people. He was bored by that experience. What he realized was, “I’m good at this, but this isn’t who I really am. Who I really am at my core is a storyteller.” So he quit major league baseball to go to film school and become a professional storyteller. Now he’s producing a documentary about his parents who were Cuban immigrants who have this incredible story of leaving during the reign of Castro and all of that. If you’re a writer, you need to start calling yourself a writer. If you want to start a business, you need to start calling yourself an entrepreneur. But—and this is important—you can’t stop there. The next necessary step is as soon as you start doing that is you have to start acting as if that’s already true. Professional writers get up every day and write. So if you are calling yourself a writer, you have to keep earning that title every single day. Derek Sivers says, “If you stop doing the work, you lose the title.” So you have to keep re-earning the title every single day, and if you’re an artist, you have to be making something every single day. I think that’s my challenge. Call yourself an artist, then start doing that work every day. Then lastly, we talked about practicing in public. I would challenge you, the number one best practice that I saw with professional artists, writers, creatives is they were constantly practicing in public. All that means is they were doing something every day where they were sharing part of their work. It could be a work in progress, a painting that they were doing, a novel that they were writing. They were sharing pieces of it every single day, often online—you know, Instagram, blog, Facebook, whatever. The whole point of that was so that they could stay on it. It made them show up and do the work, and if they didn’t, people would notice. It also builds an audience over time. Eventually, when the book comes out, when the thing launches, you’ve got a fanbase of people who are cheering for you and you don’t have to worry about how am I going to go market this thing. People have been watching you do your work. Call yourself a writer, an artist, whatever. Start doing the work, and then do something every day to share what you’re doing. If you do that over and over again, something good is going to happen. Jeff Goins: You can find me at my blog, GoinsWriter.com I have a large community of writers there, so lots of free resources for writers and authors there. You can sign up for the email list and get my weekly email updates. 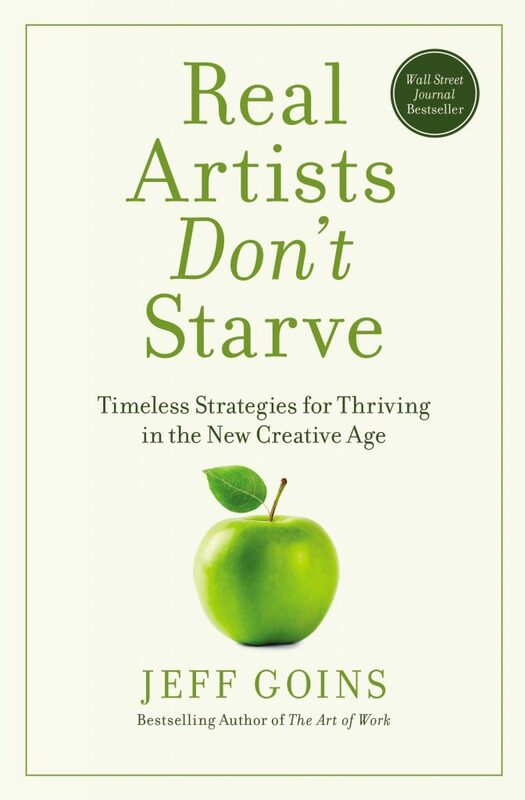 Get Jeff’s new book Real Artists Don’t Starve on Amazon. Find out more at GoinsWriter.com.